This buffalo had to be put down after a hit-and-run on South Lantau Rd on Monday morning. The four-year-old female was crossing the road just below the Nam Shan camping site when it was hit at about 7am. The driver faces up to 12 months’ jail time and a $10,000 fine for failing to stop. 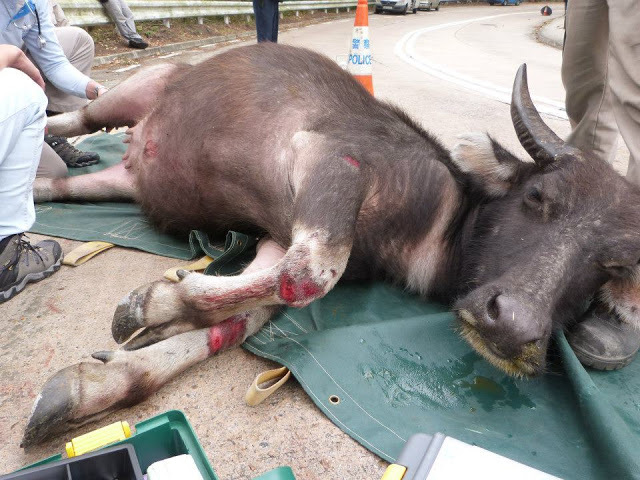 It is the second buffalo killed on Lantau roads in two months. If you have any information, please contact the police of the Lantau South police on 2984 6200 or the Lantau Buffalo Association via its Facebook page.